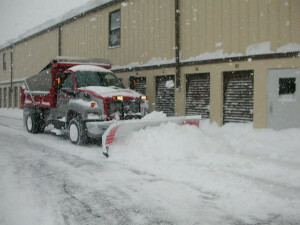 What are some of the issue you should consider when hiring a commercial snow plowing company to clear snow from your driveway? This is what many people ask themselves the first time they think about hiring someone to clear snow from their driveways. We have put together a list with a short description of each these issues for you to consider. One major item that come to our attention recently is the maximum annual snowfall. Some contracts contain a clause that allows the contractor to add a surcharge if the annual snowfall is over a specific amount. Most people will not care what type of equipment is used as long as the snow is removed. However it does make a difference depending on the type of driveway that you have. Snow blowers do not mark a driveway generally speaking. However trucks with blades could scrape your driveway and leave marks. You may want to consider carefully which type of equipment will be used. Some of the smaller companies will use a snow blower which they have to unload each time they use it. They will be happy to have several customers close by to reduce the number of times they need to load and unload their machine. Many of the larger companies will use either a small truck with a blade on the front. Or a tractor with a combination blade and snow blower. In both cases you will want to make sure that the edge of the driveway is marked to avoid damaging your grass. If you want this particular service, you may have to pay more for the service. Most companies will only clear driveways with the machines. A second crew may come around to those properties that have contracted for snow removal on walkways and front steps. Most companies will specify that they will only clear snow after a specific amount has fallen within a specified time period. Anything less than this limit means that you are on your own. You can choose to leave the snow on your driveway or clear it yourself. Depending on where you live the snow plowing companies that clear the cities streets may not get to your street ahead of the company clearing snow from your driveway. The question is whether the snow plowing company you have hired will return to clear the bank of snow that they street snow plow leaves at the end of your driveway. Sometimes this can be a large amount and no one really wants to deal with that. Make sure your company is coming back to clear snow from the end of your driveway. Some will require 100% paid in advance for the entire season, while others are happy with two equal payments, one at the time the contract is signed and the other half halfway through the season. Most companies have a regular period for their contracts, usually from Nov 1 or Dec 1st through to the end of March, depending on where you live and how long your season is. The above items are the major issues to consider aside from overall price which is sometimes negotiable. You may also want to ask for references from other customers and also include any special conditions that you may have that relate to your property.